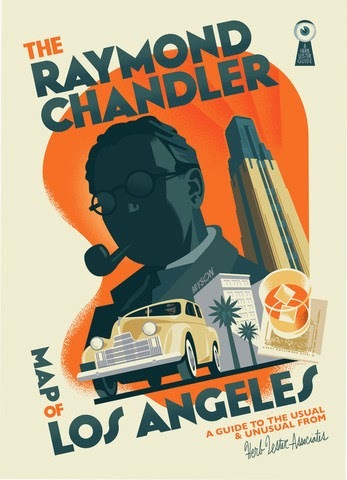 What a kick it is to announce the publication of my second collaboration with Paul Rogers, a fold-out map of the city where Raymond Chandler lived and wrote. Paul slyly tells the tale of the project's genesis here. It is published by Herb Lester. If you'd like to purchase the map from me, click here. Also available: my novel featuring the young Chandler, The Kept Girl (Paul Rogers' and my first collaboration), or the vintage 1985 Aaron Blake Chandler map. Amazon also carries the new map, and Herb Lester does, too. 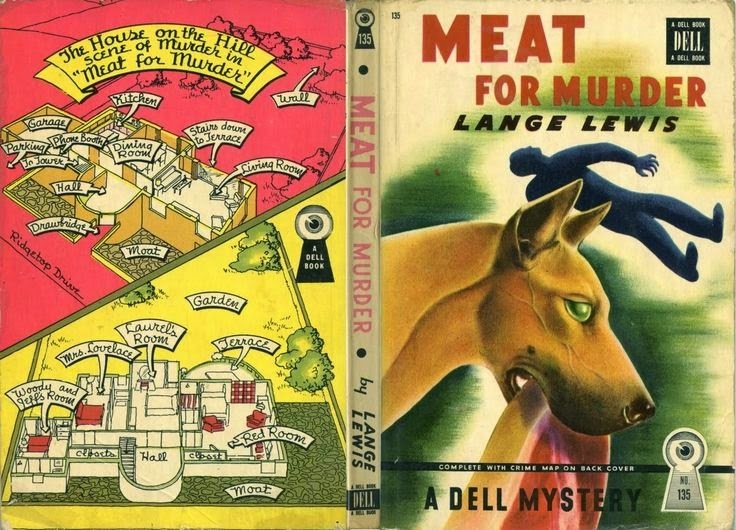 ABOUT THE RAYMOND CHANDLER MAP: The map's graphic style is inspired by the Dell Map Backs -- a series of cheap paperbacks issued between 1943 and 1951, most featuring a crime scene map on the back cover. 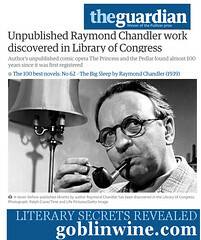 It mixes locations from the books, the films and Chandler’s personal life. There’s the crummy dive where Moose Malloy went looking for Velma (Murder, My Sweet / Farewell, My Lovely); the actual lounge where Marlowe and Terry Lennox ordered gimlets (The Long Goodbye); the top-floor suite where oil executive Chandler got his priceless education in how a dirty, sun-drenched city really operated. It’s an insider's guide to the city Chandler knew, and can still be visited today. Paul selected fifty iconic locations and designed the handsome two-sided map with its evocative spot illustrations: neon signs, lonesome cocktails, towering palms, rain-drenched death houses, and alternate covers for each of Chandler's novels. I wrote the accompanying narrative, fifty pocket entries revealing unexpected lore about the real-life inspirations behind Chandler's fictional crimes and how the writer navigated Philip Marlowe's city. 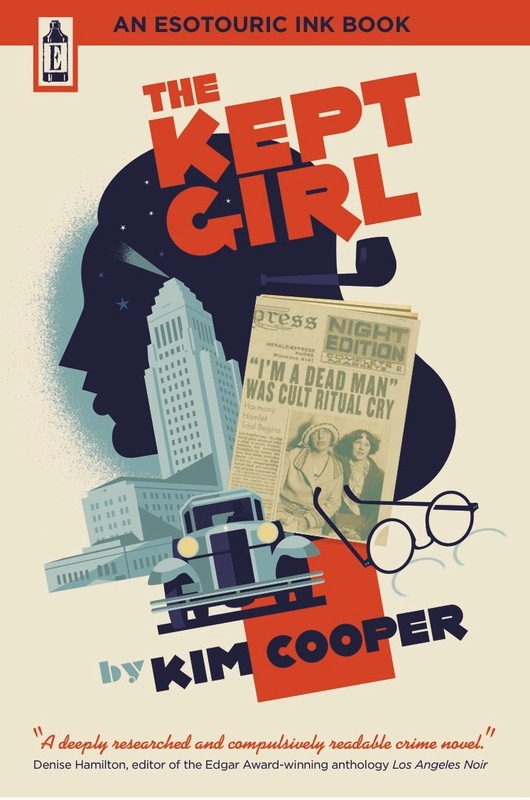 With map in hand, an armchair tourist can follow Philip Marlowe's investigations from Downtown to Hollywood, to the fictional Bay City (Santa Monica) and Idle Valley (Encino). Or they can hop into the car and visit some of the 27 actual locations -- each one handily marked with Raymond Chandler's spectacles -- or one of fifteen places where the writer lived. 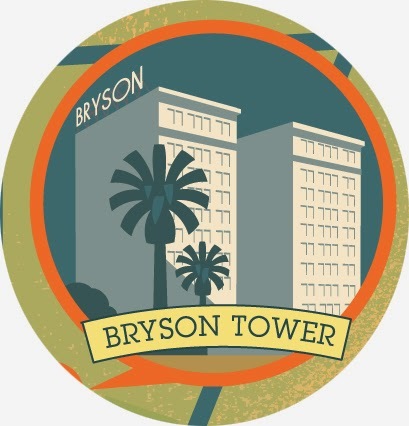 And four times a year, they can consult the map while joining me on an Esotouric bus adventure through Raymond Chandler's Los Angeles, comparing the real places to Paul Rogers' Art Deco illustrations. 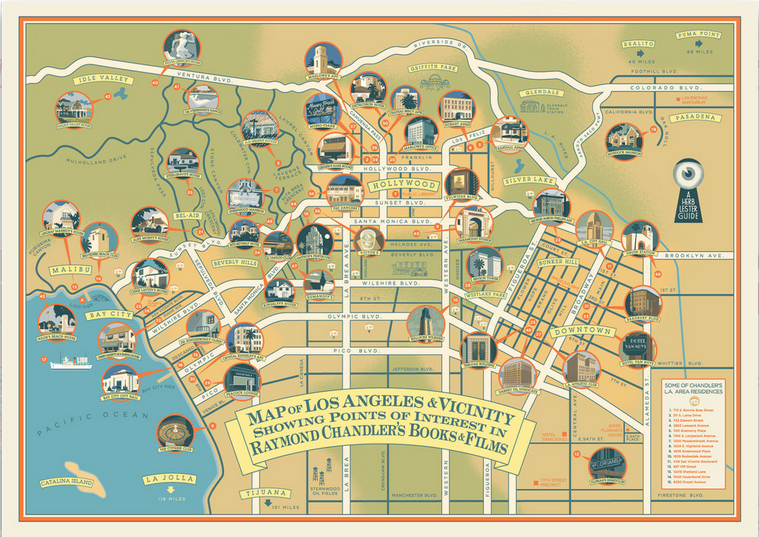 The Raymond Chandler Map of Los Angeles is a must for fans of Raymond Chandler, Los Angeles architecture, contemporary illustration and the intersections between fact and fiction that color the best in noir literature. Why not make it part of your library today? is there a way to buy this map locally without having to wait for shipping? Or have it shipped to my hotel? I sent you a msg in instagram about it, thanks!